The most important part of the job is to have a set plan, an idea as to what we are trying to achieve, so before I fully immerse myself into the modeling of the scale model I have to start with the foundations for building the armature. With the set of images that I took previously of the Corvette, by scanning I can scale the images and produce a one fifth scale rendering which will provide the underlying image for the tape drawing. 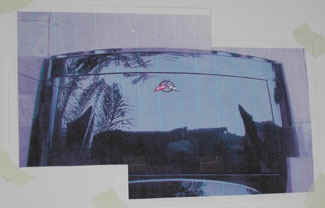 Each photograph of the vehicle is taken and enlarged on a photocopier to provide a one fifth, scale sized image. I found that I would have to piece the pages together, considering the overall length of the scale model would be approximately 36 inches or 913.0 mm, taken from the Corvette technical data page. With the 8.5" x 11" sized sheets of paper from the copier the following set of underlying drawings were made. 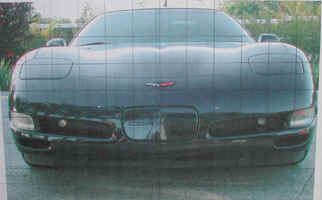 The front view of the Corvette was pieced together with four sheets of 8.5" x 11" copier paper, enlarging the image to one fifth scale. With each section overlapping, the front view was completed and checked to ensure overall width was correct. Once taped together a grid was penciled on to assist in modeling at a later stage. The same process was used for the side view. The wheel base was the controlling factor for this exercise even though the overall length was foreshortened due to camera angle. On all of the images that are used for this exercise you will find that one of the dimensions will be slightly different to the technical data. Choose the dominant dimension for scaling purposes and corrections can be made in the three dimensional stage. The rear plan provides an overall width for the back end plus the trunk opening line. This will enable a ground template to be made for dragging in the rear form initially. Even though this particular camera shot is not very level it will still provide the necessary information for detailing the back end of the clay model. 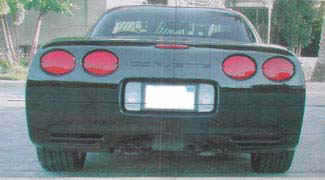 License plate opening, tail lamp and lower valance are all readily provided. The horizontal line is marked on the enlarged photocopy at tire touch down and a perpendicular line is scribed to form the centerline. Minor adjustments can be made by checking the lamp openings for parallel to the ground line. From the front and rear end view the initial drag sections can be made to block in the main form which will become more apparent when I start the tape drawing. Each image will provide information for surface development by the way the light interacts with the surface, exactly the same way a designer would depict his trail of thought on his rendering. In most cases this may be the only indication as to how the surface will develop. The plan view is pieced together exactly the same way as all the other views with the dominant dimension being the overall length. This will provide us with all the plan lines in the correct position. With all the basic views enlarged on the photocopier to one fifth scale I can proceed with overlaying Mylar Drafting Film onto the drawings. By adding a grid to the Mylar it will provide an easy reference tool when checking dimensions against the clay model. I would mark up the Mylar with 20.0mm lines to represent 100.0mm in full size, making it easy to reference against the technical data. With the basic images taped to an eight by four sheet of white faced Masonite I marked a grid of 100.0mm throughout the Mylar as a starting point. My initial idea was to line up the grid with the touch down of the tires and line up one of the vertical grids with the center of the front wheel. This will allow easy vertical and longitudinal measurements from the grid. With the Mylar in place I can now start to tape the profile and major feature lines of the vehicle from the underneath rendering with 3M black photographic tape. This will provide the necessary information for the start of the modeling buck. Now for the basic tape drawing.